A year or so ago, we had a funny dinner table conversation about our “nemesis foods:” the things we really, really don’t like to eat but occasionally must to be polite. Ben’s is chili; Eli’s is sauteed spinach; mine is sweet potato casserole (the kind with marshmallows on top [shudder]). Tony’s is something I don’t eat at all anymore but when I was a kid, it was my absolute happy comfort food, and my mom made it almost every week. This week, visiting my parents, I offered to stock their freezer with meals for when they don’t have the energy to cook. My mom and I talked about a couple different options — enchiladas, soups, lasagne, curries — and decided on a corn chowder, a vegetable and tofu curry (using many of my dad’s garden vegetables), and, as a cold weather comfort food, Tony’s nemesis food: tuna noodle casserole. 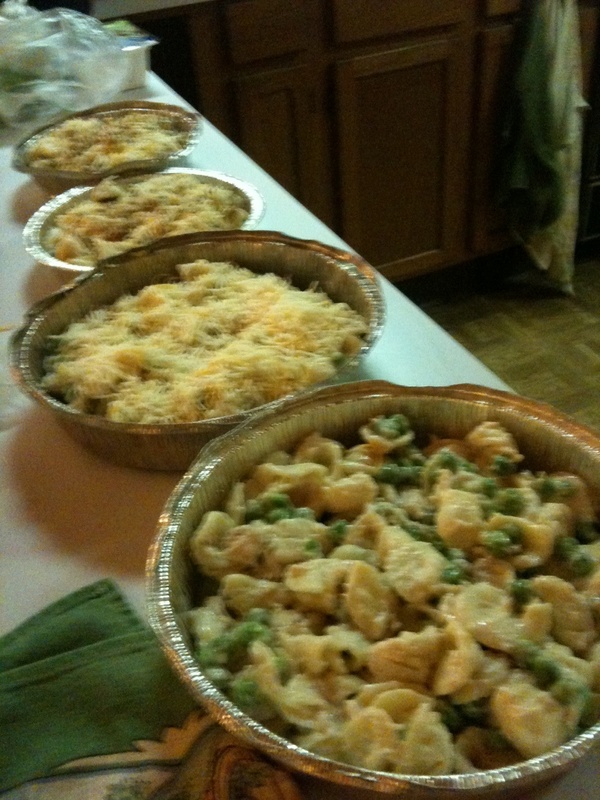 Now it’s my sister who makes it for her family most often, and her essay for The Dish shares a funny story about my nephew’s love for this dish, plus her recipe, which I offer you here, following this picture of the tuna noodle casserole assembly line. My husband kept his distance. My kids would eat this every night if I would make it. Especially Nick. 1-2 cups frozen tiny baby peas. Or not so tiny ones, if you don’t mind them. They seem kind of icky to me, but I like the little tiny ones. You don’t need to thaw these. 2-3 cups shredded cheese of your choice. I usually use 2 cups of colby-jack and a cup or so of parmesan or romano, but it depends what I have in the house. Something that melts well is what you’re going for, and since you’re probably feeding kids, don’t bother with really good cheese. I buy bags of shredded stuff and throw them in the freezer, then pull out whatever I have and use it. “Italian” blends work fine, as do “Mexican.” Real cheese that you shred yourself is probably better. OK. So you have your ingredients. Turn your oven on to 350 or so (400 if you’re in a hurry) and make sure you have a casserole dish that holds a pound of cooked pasta. If you already knew how to make a bechamel (aka white sauce, aka cream sauce) you could have skipped those last two paragraphs. When the sauce has thickened take it off the heat. When the pasta water boils, duh, add the pasta and boil it until tender but not mushy. Drain the pasta and run cold water over it to stop it cooking. Dump the pasta back in the pasta pan. Pour the sauce over it and mix it together. Then add the tuna (breaking it up in the can a bit before you dump it in) and the peas. Mix it all together so that the tuna and peas are evenly distributed. Put half the pasta/sauce/tuna/peas mixture in the bottom of the casserole. Scatter half the cheese over it. Then the rest of the pasta, and the rest of the cheese. If you like, blanket the top with bread crumbs. Crushed up Ritz crackers or potato chips would be decadent and tasty. Pop the whole thing in the oven and bake until the top is golden and crusty. This will take 15-20 minutes at 400, up to half an hour at lower heat. Since everything was already cooked before it went in, all you really need to do is melt the cheese and brown the top, but if you have to go take a shower or something and need it to be in the oven longer, you might cover the casserole when you put it in, then take the top off and blast the heat up to 425 or so for the last few minutes. the funny thing is, I hardly ever make this anymore. Though, still, every time I do, Nick is happy! PS–have you ever had my sweet potato casserole, which does not have marshmallow on top? I might have to make it for Thanksgiving…it’s more like dessert than a side dish, but incredibly tasty. I have tasted your sweet potato casserole, and while it’s miles better than the kind with marshmallows, I just cannot eat sweet potatoes with any extra sweetening, and I don’t much like them pureed, either. I like them with lime, hot pepper, cumin, etc — anything to cut the sweetness. So if you make your casserole for Thanksgiving, I will smile and pass the dish: all the more for you!